Wearing a tie to the interview may appear to be a thing of the past to many of us. As fashion in the modern world has seen changes at a very fast pace, the corporate world has also seen changes in fashion over the past few decades. These changes have been gradual and slow. One thing that has almost become extinct in many of the world’s corporate circles is the use of a tie with apt accessories. While the officers at higher ranks still wear ties, these accessories are now set aside for corporate meetings and interviews. Wearing these ties everyday may appear silly and unnecessary to many. Due to the rare use of these accessories, very few individuals know the aesthetics and the right way to wear these during interviews and corporate meetings. If you are planning to hold a job in the corporate sector where these corporate dressing styles are still prevalent, you must be aware of the best styles and ways to wear a tie. Read to know more about the styles, colours and accessories that make ties an ideal accessory for suiting and shirts. The tie variations are mainly based on the construction and dimensions of the ties. The most common basis for classification of ties is its length. There are long as well as short ties available in the boutiques and you must know what kind of tie will go best on you. Long ties usually look good on men who are taller and have an athletic built. Short ties, on the contrary, go best on men who are a little on the healthier side. The breadth of the ties also varies and you need to pick a tie that goes best with your suit or shirt. If you have a broader construction, you must opt for a broad tie. Slim ties look good on men with narrow construction and who do not have broad shoulders. Colour Variations – What Color Tie To Wear For Interview? The ties are available in many different colour variations and you have a wide range to choose from. You must select the colour of the tie that will go well with your complexion and the colour of the suiting and shirt you select. Ties may either be selected to complement the shade of the shirt you are wearing or contrast. If you are wearing a suit, make sure that the tie is in contrast with the shirt but complements the suit. Poor combinations may actually create a poor visual impact and affect the entire interview process. Plain black ties are usually rare. You commonly get to see ties in patterns of black and grey and the combination is really appealing. The dark shades of ties usually complement dark suiting. Brown is a very common tie colour and the beauty of this tie colour is that it goes well on many different shirts and suiting. Brown ties go well with dark as well as light shirts. The pattern of the tie matters when you want it to match perfectly. As there are many shades of grey and many variations in patterns in grey ties, men have a great choice in this shade. Grey ties look great on dark blue suits or against light coloured shirts. Ties in the dark blue shade are most elegant and look classy on most men. The most common and stylish pattern in the dark blue shade are the slanted stripe pattern and the designer pattern. The crimson red colour has become so common among hotel managers and hospitality staff that common men hesitate to wear the plain red tie while attending an interview. Yet, red ties go pretty well with white shirts and black suits. If you think the tie looks good on you, there is really no harm in wearing it. The countless pattern variations in ties leave you confused when to wear which tie. Here we have listed out a few of the common tie patterns and where you may wear this. Hope it helps to clear your doubts. Small checks are very common in professional ties. The checks may be light or dark in shade. Sometimes there are checks in two shades or the same colour while other times you get to see check of two contrasting colours on the tie. Large checks are also in vogue in professional circles. These are usually common in darker shades of ties like dark blue or maroon ties. These look classy if you wear it on a faded shirt. In slant stripes there are variations. Thin slant stripes are rare and not too classy. You may come across thick slant stripes or combination of thick and thin slant stripes. These look great when you are wearing them on a corporate suiting. The floral prints look amazing if you make the right choices in ties. People usually hesitate to take floral print ties because they have often come across really bad examples of floral prints on ties that look more childish than professional. Fine floral print ties where the patterns do not stand out are great for interviews and meetings. Avoid loud and gaudy colours for floral print ties as these can really hit the eye of the interviewer and create a bad impression. Paisley patterns are one of the best designer patterns for male ties. These patterns look great even in light shades like cream, grey or light blue. You may wear this even on dark suits. It goes equally well with light as well as dark shirts. 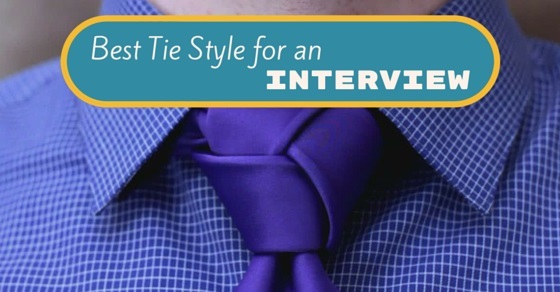 Plain ties are also commonly worn in interviews. If you have to select a plain tie, make sure you select one that has a smooth and appealing texture. Pick a shade that is not too gaudy or loud. There are many different types of tie accessories that add further class to your already appealing attire. Tie accessories must be selected with great care. You must know the purpose of each accessory when you go ahead to buy them. Tie bars are usually used to keep the tie in its place. These are made of metal and are usually shorter than the width of the tie. There are several options in tie bars and you must select one that is of the desired length and goes well with your tie. Tie bars are to be placed at around the centre of the tie and attached to the shirt. The major purpose of the tie bar is to keep the tie in place all day long. As the trends change, the age-old tie bar is replaced by classy pens that may well serve the same purpose. You may use Parker pens or other classy pens to keep your tie in place. If you are selecting this option, make sure your pen does not leak. How To Wear a Tie? With all that said, we sure have readers who are confused how to wear a tie. The twists and turns to make a tie look the professional best leaves many young men confused. There are basically four types of tie knots that are common in professional circles. Here we have listed them for your knowledge. All these forms of tying the tie are accepted in corporate circles. If you do not know exactly how to manage these knots, you may refer videos online that direct you to wear a tie. While fashion is accepted in the corporate world, you need to keep your limits. You must strictly avoid ties with images of toy cars or cartoon characters on an interview. Organizations do not digest the most modern fashion and may even rebuke you and regard you as unprofessional. The bow style tie that was once very common is now almost archaic and restricted to certain sects in the Middle East. Wearing a bow tie to an interview may appear too old fashioned and not be completely acceptable. These ties do look great when you are out with friends or on an occasion. Avoid these ties when you plan to attend official meetings. The times have truly changed and this has made shopping really easy for the common man. You can purchase a tie of your choice sitting at home. You also get to visualize how the tie will look on your shirt and suit. The modern customization options also enable you to design your own tie by visiting the various online websites and checking out the patterns and styles offered. All the prominent brands like the Reid & Taylor, Raymond’s, Peter England and Louis Philip have websites online where you may view their latest products and select the best option as per your requirement and choice.